AIT Pune offers admission in undergraduate engineering programs based on All India Rank obtained in JEE Main 2018. 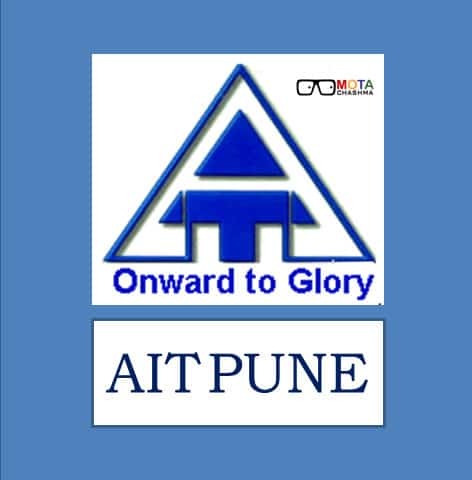 AIT (Army Institute of Technology), Pune is an undergraduate engineering college which offers admission only to children/wards of serving/retired Army personnel who have served Indian Army for at least 10 years. There will be no separate admission test conducted by AIT Pune. The admissions are done on the basis of JEE Main 2018 which will be held in Pen & Paper Based on 8 April 2018, Computer Based Test on 15 and 16 April 2018. AIT Pune 2018 offers admission to 300 seats for undergraduate courses in B.E. for a duration of four years each. AIT Pune is affiliated to Savitribai Phule Pune University and recognised by All India Council for Technical Education (AICTE). Candidates can visit this page to get the complete information regarding AIT Pune Admissions, eligibility criteria, admit card, result, counselling etc. Admission is offered only to the students who qualify the AIT Pune Admission Criteria & fulfil the Eligibility Criteria. Only children of serving/retired Army Personnel or children of war widows are applicable to apply for AIT Pune Admission 2018. Age Limit: Candidates whose date of birth falls on or after October 1, 1992, are eligible. Must fulfil the age limit as per JEE Main 2018 Eligibility Criteria. Class 10 Mark sheet or Birth certificate will be considered as proof of age. Nationality: The candidate must be a citizen of India or a person of Indian origin (PIO) from any foreign country but who intends to settle permanently in India who has availed Indian citizenship at the time of admission. Academic Qualifications: Candidates must have passed or appearing Class 12 or equivalent exam in March/April 2018 from a recognised board with Physics, Chemistry & Mathematics as the subjects.Candidate should obtain at least 45% in each of the subjects. Appearing in JEE Main 2018 is Mandatory: Candidate should appear for JEE Main 2018 examination and should have acquired appropriate/required ranking as per All India Ranking List published by CBSE for admission to Engineering Colleges. (In 2017 last admitted student’s All India Ranking was 1,06,970). Apart from filling the JEE Main Application Form, the candidates also have to fill a separate AIT Application Form and this can be filled via online mode only. The candidates can fill the application form and make the payment through Credit/ Debit Card/ Net Banking. Candidates interested in filling AIT 2018 Application form are required to apply for JEE Main 2018. They also need to fill the AIT 2018 Application Form, failing which, no candidature for admission will be entertained. Candidates must state JEE Main Roll Number at an appropriate place in the AIT Application Form. The absence of this important input may result in rejection of the AIT Application Form. Candidates are advised to use online facility for applying as far as possible. The cost of the prospectus will not be refunded if returned. AIT will not be held responsible for non-receipt of Application Form due to failure on the part of Postal Department, Courier Service, or any other reason beyond the control of AIT. The candidates filling the AIT Pune application form need to fill it in a proper format because once the application gets processed, the candidates will not be able to do any changes. Candidates are also advised to keep at least two printouts of the application form with them for future reference The duly filled in application form must be reached the Director of AIT on or before the due date. Application Fee - The candidates have to pay Rs 500 as an application fee in order to complete the application process. The application fee is non-refundable and can be submitted in given below modes. In case the applicant is paying the application fee after the due date he/she has to pay additional Rs 1000 as late fee charges. The annual fee for B.E. courses at AIT, Pune is approximately Rs 2,58,640 (including Hostel & Mess Charges and Security Deposit). Candidates applying for AIT Pune Admission 2018 will be selected on the basis of JEE Main 2018 score. Selection will be based on JEE Main 2018 score and normalised score in Class 12 or other qualifying exams (60% & 40% weight age respectively). AIT Merit List: The Army Institute of Technology will release the merit list on 15 May 2018. The admission at AIT Pune will tentatively take place within two weeks after the date of declaration of JEE Main All India Rank. No cumulative weightage for Gallantry Award and Wards of War Widow will be granted. Only one of them will be granted, whichever is higher. The first online Army Institute of Technology counselling will be conducted from 21 May 2018. The list of candidates who are eligible for provisional admission, as per their choice and availability of seats, up to AIT Merit No 300, will be uploaded here. Candidates will be allotted the seats on filling up of online “Admission Form” and online payment of Rs. 50,000. How to reserve a Seat in AIT Pune? STEP 1: Candidates have to fill up the online form for the confirmation of the seat. STEP 2: Now the candidates have to pay the online fee of Rs 50,000. STEP 3: The reservation of confirmed seats by AIT Merit list students should be carried out by the scheduled time. Note: Any further clarification may be obtained from Jt Dir, AIT, jd@aitpune.edu.in or Mob No 8275879337.